Why don’t you use mailto: links? Why can’t I select the text? Why do you have numbers spelled out? A major cause of SPAM are automated web crawlers that collect contact information off websites and then send all sorts of junk out. Some sophisticated crawlers even download images and scan for contact information. We have made our contact information available to you, our human friends, without giving these bots an easy way to collect information we don’t want them to have by making our contact information an image instead of text, and with words instead of numbers. 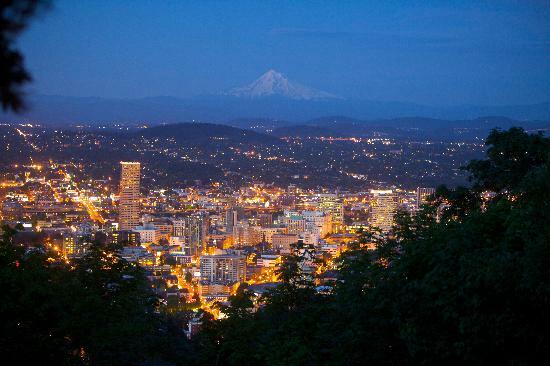 A tip from your friends at SmartGuyz, Inc.
SmartGuyz, Inc. is a private corporation housed right here in Portland, Oregon in the good old USA. We’ve been serving you since 1996, and are pleased that our many faithful customers have come back to us for the one and only ScreenCam®. Don’t hesitate to contact us if you have any questions or comments. We’d love to hear from you! 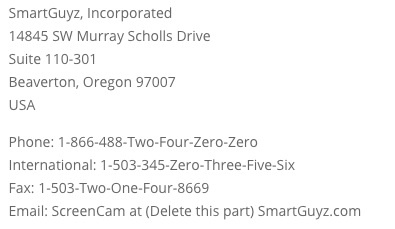 About ScreenCam: We’ve received questions about other companies claiming to offer ScreenCam®. Let’s set the record straight. There is only ONE true ScreenCam®, and that’s the one you find right here. The popularity and innovation of ScreenCam® has caused some firms to claim that they are also “Screen-Cam”-type software. Don’t be fooled. Look it up in the US Government’s Trademark website to see which is the TRUE ScreenCam®. There is only one true ScreenCam, and it’s right here and no where else. Click here to find out for yourself. Be sure to get the one and only ScreenCam® from SmartGuyz, Inc.
Why do we say that ScreenCam is the “First Screen Camcorder in the world?” Because it’s true. ScreenCam has been around since the 90s, back when Lotus Development came up with the first screen camcorder! See the article at Wikipedia. We have carried on the proud tradition by continuing to develop ScreenCam and listening to how you want to use it (e.g. with YouTube) and rewriting, adapting, and continuing to move ScreenCam forward to the new millenium. All from your friend at SmartGuyz, Inc. Remember, there’s only ONE ScreenCam!